Professor Chen is a member of the Chinese Acupuncture Association, GCTCM (UK) MD of TCM Hospital, Chinese Professor of CATA, Oriental Medicine Academy, Senior Master of Tuina, and R.TCM.P of the CTCMA of British Columbia Canada. 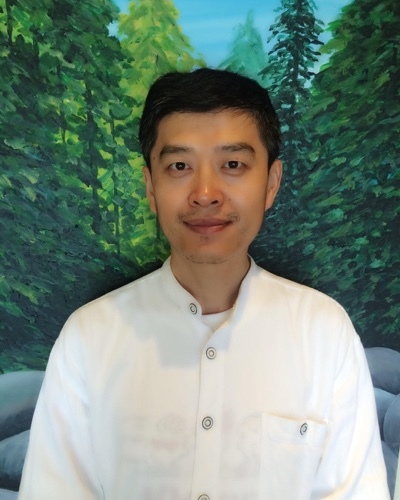 Professor Chen is a Doctor of Traditional Chinese Medicine (TCM) who is registered in the United Kingdom, in China, and he is an R.TCM.P here in British Columbia, Canada. After graduating from the University of Chinese Medicine in China, he continued his quest for knowledge by practicing at a local TCM Hospital as an internal medicine doctor under the guidance of the renowned TCM professor Shouli Yue. There, he expanded his clinical and teaching abilities in both acupuncture and herbal medicine, which allowed him to join the Chinese Acupuncture Association and work as a professor of the Chinese Acupuncture & Tuina Association (CATA). While practicing acupuncture, herbal medicine and Tuina, Professor Chen also began to develop his expertise in internal disorders such as cardiac and stroke symptoms, brain and mental wellness, along with pediatric and prenatal health. In 2001, Professor Chen was invited to practice Chinese Medicine in the United Kingdom and brought along with him his knowledge of herbal medicine, which resulted in the creation of 30 new herbal formulas that solved local health symptoms. The concept of prevention, which is an important cornerstone of Chinese medicine, became Professor Chen’s focus when he came to North America. He also brought the modern research of TCM from Asia to his practice in the West. This allowed him to adapt the ancient oriental medical practice into newer, more modern fields and improve the all around perception and education of TCM to North Americans. Trained in the classical tradition, he carries historical school lineages of Chinese Taoist and Tibetan medicine. As a martial arts master he chaired on the Shandong Universities’ Martial Art Association and has practiced Tai Chi and Meditation daily for the past 28 years.